I'm a sucker for James Patterson, despite his recent disappointments with the casting of the Alex Cross movie. I am an even bigger sucker for his romance novels. So reading The Christmas Wedding was guaranteed. When I first started reading it, I grabbed my leopard snuggie, a hot mug of chai tea, warm cookies straight from the oven and my NOOKcolor. Clearly I was ready for a night of reading romance. The Summerhills haven't celebrated Christmas together in three years. The 54-year-old mother, Gaby, announces she is getting remarried on Christmas Day to a groom who will remain secret until the wedding day. The three suitors are Tom Hayden (a 54-year-old farmer and former pro hockey player), Jacob Coleman (a 52-year-old rabbi) and Martin Summerhill (Gaby's 55-year-old brother-in-law). Gaby also has a surprise gift for her four children that could forever change their lives. Surely this will bring the family home for the holidays, right? Does this sound a bit dramatic and unrealistic? I understood Gaby's intentions to bring the family home together for Christmas, but staging a wedding to a secret groom is a bit much. I didn't think it was fair to her children or three suitors to leave everyone guessing until the day of the wedding. It also seemed like an unrealistic situation for three men to be willingly strung along. 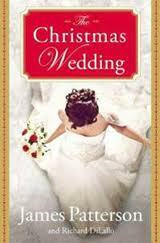 The Christmas Wedding is meant to be a heartwarming story of family, love and holiday cheer. Check out the video below of James Patterson answering questions about his latest romance novel.